9th Air Force, return from attacking enemy positions in Northern France. B26 Marauders of the 386th Bomb Group 9th Air Force, returning from a strike against VI, rocket sites in the Pas de Calais, January 1944. 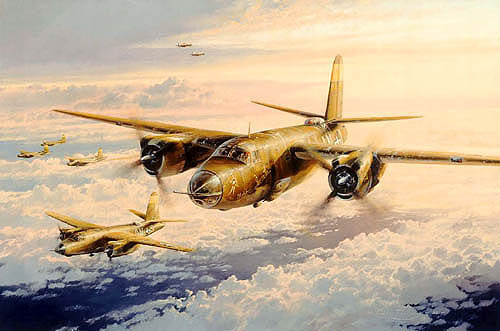 The 9th Air Force became one of the most effective forces in the destruction of VI rocket sites, railroad yards, bridges and other enemy position in northern France and by May 1944, was despatching more than one thousand aircraft a day against targets in Normandy and the Pas de Calais. Print size: 27 x 21ins.